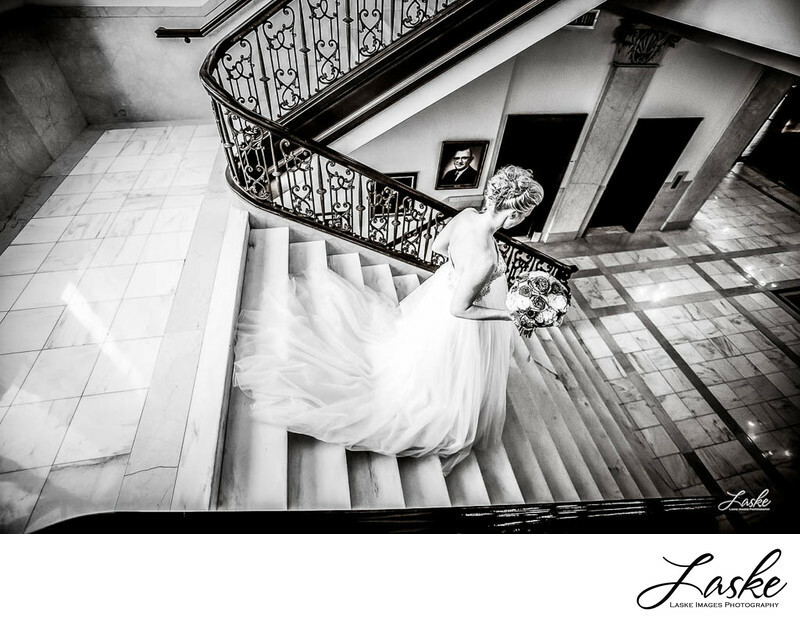 Perched from above, our photographer captured the Bride as she raced down to the lower level of the Oklahoma History Museum. Bouquet in hand and the groom around the corner, the Bride whisks away quickly to remain unseen. Our OKC Wedding photographers have a keen instinct and know where to be to capture the most amazing moments on a wedding day. You'll be delightfully surprised to see the detail and moments that would otherwise be forgotten. The beautiful marble floors of the Oklahoma History Museum adds an elegant, stately feel to any wedding. If you're looking for a formal venue to host your wedding, this is an amazing location guaranteed to have your guests in awe. Location: 800 Nazih Zuhdi Dr, Oklahoma City, OK 73105. 1/160; f/4.0; ISO 1600; 16.0 mm.